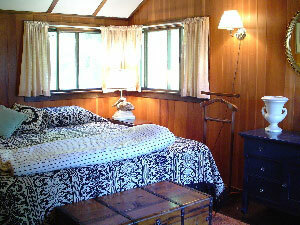 The Apple House is a well lit and spacious ranch style building that provides all the comforts of home. The newest of the Greengate accommodations, it is modernized and perfect for a couple seeking luxury within the rural Door County surroundings. 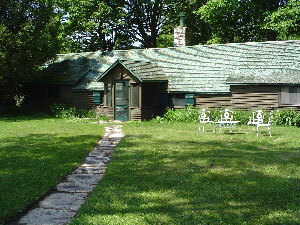 The Apple House is also the best choice for larger families or groups. Guests enjoy one bedroom, one and one half baths, a full kitchen, BBQ, laundry room, Directv and wireless internet. Open all winter long for hunters and those who enjoy the beauty of a Wisconsin winter. Dogs allowed with permission. A rustic country interior decribes the two bedroom Cabin. Charming and cozy, this accommodation is for those looking to leave behind some comforts of the modern home. Amenities include Directv, wireless internet, refrigerator/freezer, barbecue, microwave and gas fireplace. There is no full kitchen. Dishes left outside in the evening will be washed and returned in the morning. Dogs allowed with permission. Closed over the winter. The Apartment is the smallest of the Greengate accomodations. Quaint and cozy, it is perfect for a couple with one child or a single traveler and those who seek to leave the interruptions of modern day life at home. A green flight of steps will lead up to the front entry and one of the most spectacular views of the lake on the property. The Apartment has one bedroom with a full sleigh bed, one twin bed in the main living area and a full bath. You will also find a stove, refrigerator and BBQ. There is no kitchen sink, TV or Internet connection. Dishes left outside in the evening will be washed and returned the next morning. Dogs allowed with permission. Closed over the winter.